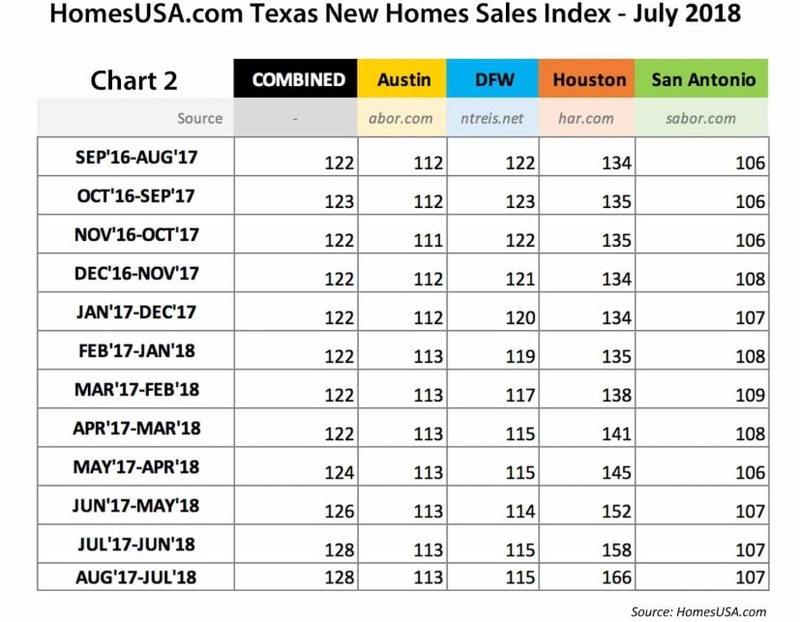 Dallas, Texas – August 22, 2018 – (RealEstateRama) — The pace of new home sales remained steady in three of the four largest new home building markets in Texas last month, but continued to slow in Houston according to data released today by HomesUSA.com, including its New Home Sales Index and data from local Multiple Listing Services. 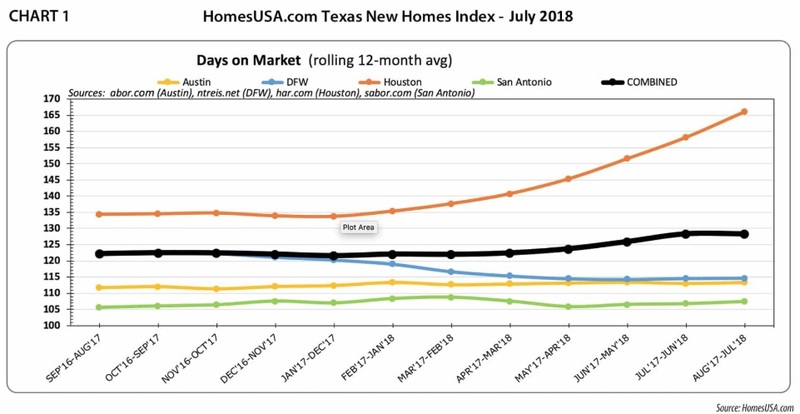 The new home sales pace in Dallas-Ft. Worth, Austin, and San Antonio remained unchanged for July, but the Days on Market (DOM) for new home sales in Houston increased from 158 days in June to 166 days in July. The Days on Market in Houston has increased every month since January. The good news for Houston is total new home sales were still higher in July. Statewide, new home sales were also up, as they were in both Austin and San Antonio. Only Dallas-Fort Worth, the state’s largest new homes market, showed a decline in new home sales in July. 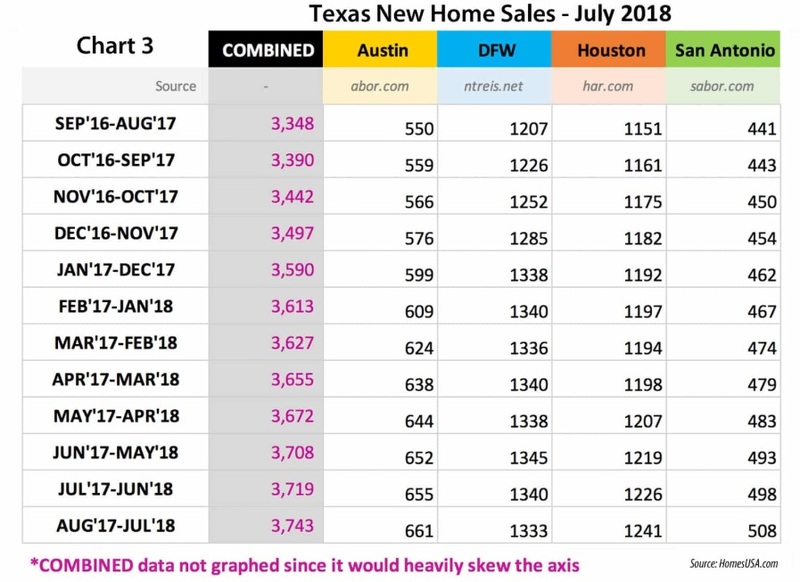 “Despite the fact that Houston’s sales pace continues to slow, there is still strength in their new homes sales numbers,” said Ben Caballero, owner of HomesUSA.com. “Houston’s average new home price is up for the second month in a row as are its total new home sales. 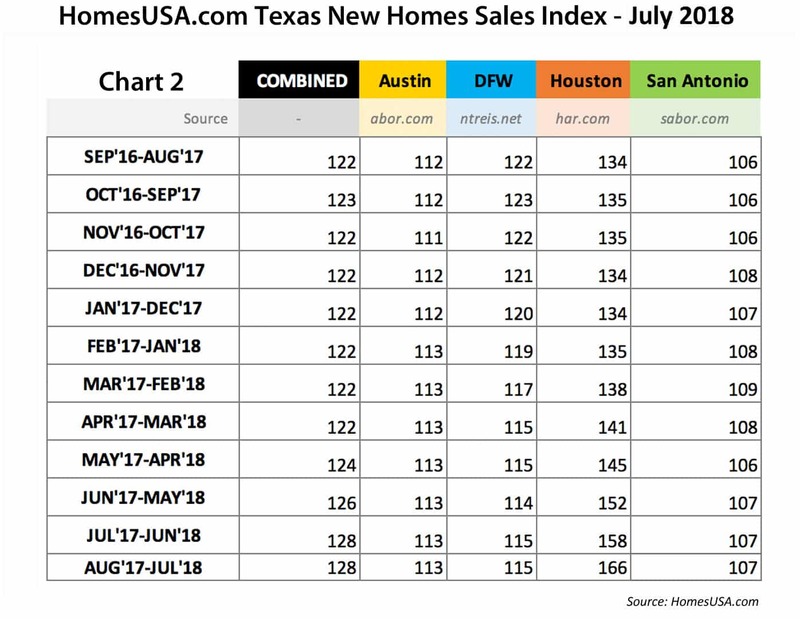 What’s somewhat surprising is that Dallas-Ft. Worth, which has posted the strongest numbers in the nation month after month, has shown its first soft numbers in quite some time,” he noted, citing other information released today by HomesUSA.com based on data from local Multiple Listing Services. 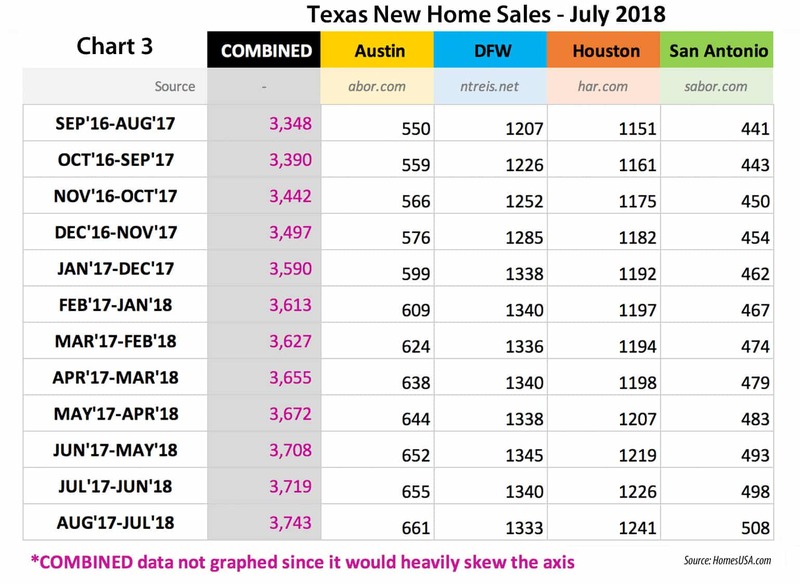 Real estate’s first Guinness World Records holder for home sales1, Caballero, is sharing this Texas new homes data in advance of tomorrow’s announcement by the Commerce Department on New Home Sales for July. The Commerce Department will report nationwide new home construction data at 10:00 am Eastern, Thursday, August 23, 2018. Statewide, the number of new home sales in Texas jumped last month, from 3,719 in June to 3,743 in July. That’s according to data compiled by HomesUSA.com from local MLS and trade associations, including the Houston Association of REALTORS, North Texas Real Estate Information Systems, San Antonio Board of REALTORS and the Austin Board of REALTORS. Ironically, all of the state’s largest home building markets showed higher sales last month, except it’s largest: Dallas-Ft. Worth. New home sales in Dallas-Ft. Worth continue to slow down, falling slightly from 1,340 in June to 1,333 in July. In Texas, new home prices rose slightly as the statewide average price increased from $350,941 in June to $352,409 in July. In Austin, the average new home price jumped slightly from $365,928 in June to $366,504 in July. 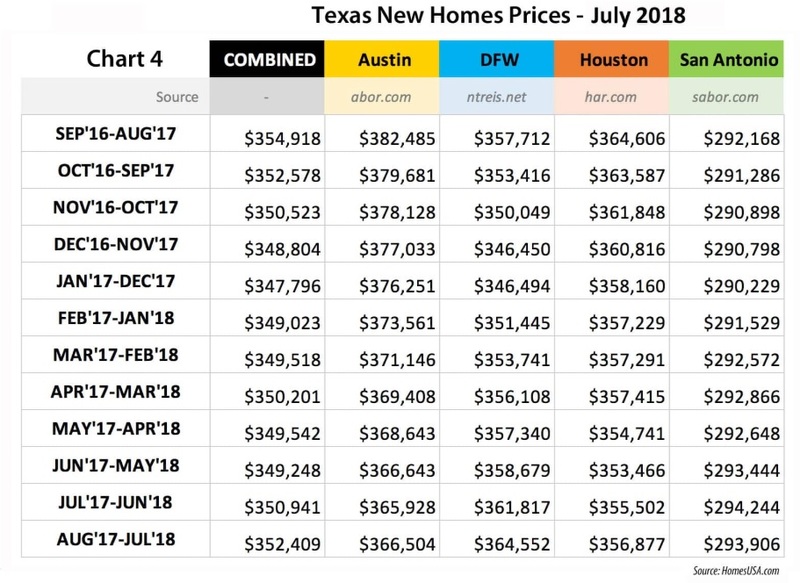 In Houston, the average new home price increased slightly from $355,502 in June to $356,877 in July. 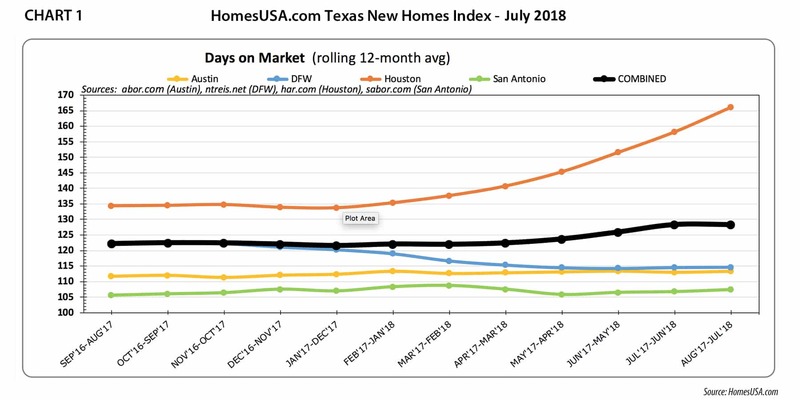 The HomesUSA.com Index is a 12-month rolling average of the Days on Market (DOM) for new homes listed in the local Multiple Listing Services (MLSs) for the four largest Texas markets, including Dallas-Ft. Worth, Houston, Austin, and San Antonio. 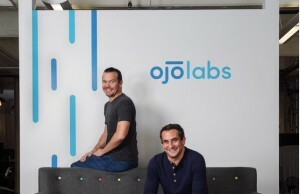 Created by Caballero, who was named “Most Innovative Real Estate Agent” by real estate news firm Inman News, it is the first index to specifically track the sale pace of new home sales. Ben Caballero is a Guinness World Record holder1, earning him the reputation as the world’s most productive real estate agent. 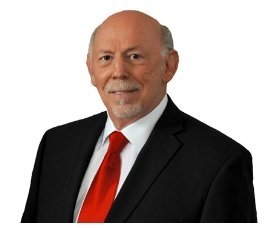 Top-ranked in America by REAL Trends since 2013, as published in the Wall Street Journal, he is also the only agent to exceed $1 billion in residential sales transactions in a single year; a feat first achieved in 2015 and repeated each year since. 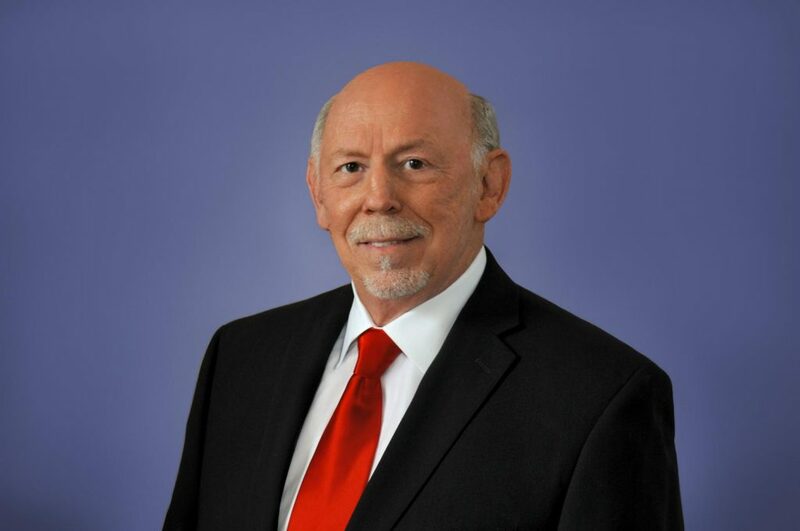 An award-winning innovator, Caballero is the founder and CEO of HomesUSA.com, Inc., working with more than 60 home builders in Dallas-Fort Worth, Houston, Austin and San Antonio. 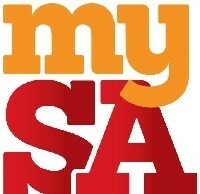 Learn more at HomesUSA.com |Twitter: @bcaballero – @HomesUSA | Facebook: /HomesUSAdotcom. Note for journalists: You may contact Ben Caballero directly on his cell at (214) 616-9222 or by email at "> . The Houston region registered increases in new home sales and prices in December, bucking the trends in other large Texas cities, a new report showed.